Should DC's movies try to create a shared universe like Marvel's? So this weekend at Comic Con, we're all expecting DC to unveil plans for more movies. A Flash movie, a Wonder Woman movie, maybe even a Justice League film. But should DC try to tie its films into one continuity? Christopher Nolan has already voted no on this one — he said a while ago that he doesn't want his upcoming Batman and Superman movies to tie together in any way. He thinks his version of Batman works best in a world with no other capes. 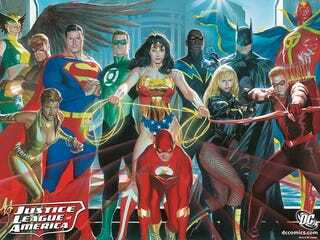 But the Green Lantern movie almost had a Clark Kent cameo, and DC's Diane Nelson and Geoff Johns told the L.A. Times that a Justice League movie is a distinct possibility in the near future. So what do you think? Should DC start drawing the strands together more?